Understand, engage and celebrate! Alley Theatre is kicking-off its 70th Season with A Midsummer Night’s Dream. Besides multiple student matinees and school night performances, we invite you to join us in a yearlong celebration of verse, freestyle and vocabulary by participating in Alley Theatre’s DREAM–HOUSTON. Our residencies are specially designed to activate students’ own teenage poetic spirits and take the fear out of Shakespeare. DREAM–HOUSTON residencies give students the tools to decode A Midsummer Night’s Dream through theatre fused with slam poetry. DREAM-HOUSTON is part of Shakespeare in American Communities, a program of the National Endowment for the Arts in partnership with Arts Midwest. 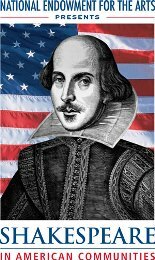 The National Endowment for the Arts in partnership with Arts Midwest presents Shakespeare in American Communities. Alley Theatre is one of 40 professional theater companies selected to participate in bringing the finest productions of Shakespeare to middle- and high-school students in communities across the United States. This is the 13th year of this national program, the largest tour of Shakespeare in American history. Alley Theatre’s goal is to provide students with an active classroom experience that gives them the tools to understand Shakespeare’s text. We will focus on creating personal entry points to the text that allow students to use their own experiences and personal feelings to deepen their understanding of the play. Through post-show multi-visit explorations, Alley Theatre will link Shakespeare and slam poetry. Held in honor of Shakespeare’s legacy, this culminating performance at the Alley will feature students performing both Shakespeare’s text and slam poetry in a celebration that brings all participating schools together. Explore the essentials of performing Shakespeare with Alley Theatre actors. This suite will include two instructional videos by national slam poets and rappers to highlight the essentials of slam poetry and rapping for theatre. Via Alley Re-Sourced (AlleyResourced.com) schools will have access to project and pre- and post-show teacher resources that can be downloaded directly to SMART Boards in classrooms. View DREAM-HOUSTON on Alley Re-Sourced.com HERE! These include backstage tours and tickets to The Cymbeline Project and our Shakespeare cabaret.